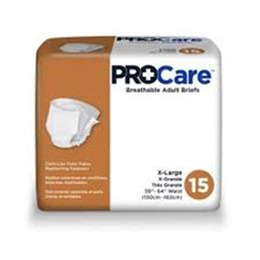 The ProCare ™ Breathable Unisex Adult Briefs by First Quality, are adult diapers that are highly absorbent and are shaped for breathability, comfort and security. The briefs feature a cloth-like outer fabric with breathable zones to keep skin dry and healthy. The Reattaching direct lock fasteners allows for multiple re-fastenings for improved fit. They also feature materials used provide a thinner and more discrete fit.